One School One Planet Podcast – Episode 13! 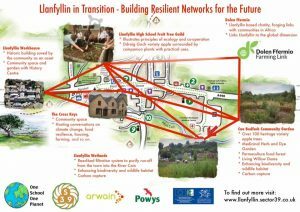 In this week’s episode we feature select edits from a community conversation at the Cross Keys in Llanfyllin on the theme of ‘Building Resilient Networks.’ We cover a lot of ground in the discussion and demonstrate that Llanfyllin already has the infrastructure in place to be a resilient community, it is just a matter of connecting the dots and starting dialogues between different segments of the community. One School One Planet Podcast – Episode 12!